Do you have puppy biting issues? If so, you need to correct your biting problems RIGHT NOW - not later! Accepting bites from a 10 pound German Shepherd puppy is one thing but if you don’t correct it right away just imagine what could happen if a 25 pound puppy chewed on you? If your puppy is being a normal, rambunctious, playful puppy, remember, both biting and mouthing are very normal behaviors for puppies. And it is very important to understand why puppies Nip and bite in the first place. 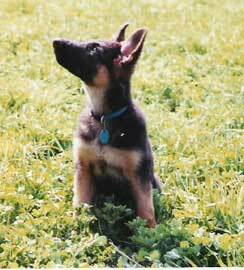 Puppies and dogs investigate the world around them - toys, food, people, litter mates, etc. - all with their mouths. A curious puppy, very much like a human baby, sticks everything where? In it’s mouth! Did you know that the more dominant dogs in dog packs use biting to discipline lower ranking dogs in the pack? This helps keep the pack ranking hierarchy in check. What is another normal learning behavior for puppies? Playing! And especially play-fighting. Play-fighting helps them develop both physical and social skills and teaches the puppy how to interact positively within their own family"pack. Puppies also learn to control their biting from the reactions they receive from their mothers and litter mates during these play and play-fighting sessions. This is called "bite inhibition." Now here comes the problem. People try to teach the puppy not to bite with human language and words which puppies don’t instinctively understand. Puppies respond to their own "dog language". We can take advantage of this fact by copying a mother dog's behaviors and teaching them not to bite ourselves using their own dog language. To understand these dog training methods, let's take a look at a typical mother dog disciplining her litter. Whenever a playful puppy bites the mother dog hard enough to hurt, she might ignore the puppy at first. If the puppy does it again the mom will growl at the pup, show her teeth and might even bite the puppy and pin it to the ground. Here's a technique we can copy when trying to teach our own German Shepherd puppies not to bite. The next time your puppy bites you, scream "OW!" in a high-pitched voice and then refuse to play with him for a few minutes. One of the best ways to discourage biting is to simply stop having interaction with your German Shepherd puppy when he begins to bite you. Puppies and dogs instinctively want to please you and the simple act of removing your attention is typically very effective in stopping the unwanted behavior. If the puppy keeps it up and doesn't get the message, give him a little scruff shake and scold him in a low-toned, threatening voice if he does it again. If your puppy is one of those hard-headed little ones that still keeps on biting flip him over on his back, scold him in that low, growling voice and gently (but firmly) hold him in that position until he relaxes and accepts your authority. Be sure to happily reward your puppy when he does not bite you during playtime. What else can you do to keep your puppy from biting you? * Avoid activities that encourage unacceptable mouthing such as playing tug of war in the first place. 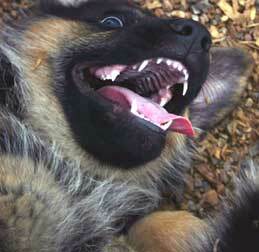 * Avoid wrestling with your German Shepherd puppy. * Don't let any children (or adults) tease the puppy. * Don’t encourage your puppy to grab at toys while holding them out of the pup's reach. It is really important to understand that if biting is allowed to go on that it will become more and more of a problem in the future. It is absolutely crucial that you make your puppy understand that you are the leader of the pack right from the start so there will not be any problems of dominance in the future. The earlier you address and take care of this issue, the better off you will all be. Your relationship with your dog is an important one. Don’t let the issue of biting come between you and your dog. 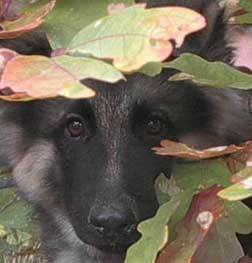 Correct all puppy biting problems in your German Shepherd right now and you’ll all be much happier in the future.